Why does the Infiniti by Conair Pro Spin Air Rotating Styler Work So Well When Drying and Styling Hair? Are you looking for an advantage to help you get your hair ready faster in the morning? That’s not surprising at all and many ladies do that exact same thing. That is why 2-in-1 hair styling tools such as hot air brushes are becoming so popular. These handy hair tools allow you to both style and dry your hair all at once as you get ready. 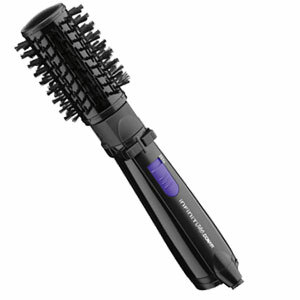 One of the more popular hot air brush models is the Infiniti by Conair Pro Spin Air Rotating Styler. We decided to take a closer look at it and see for ourselves what all the fuss is about with it. You get a lot of versatility when using the Infiniti by Conair Pro Spin Air Rotating Styler. It offers three different heat settings (high, low and cool) and two airspeed selections. Its added ceramic/ion technology is a nice bonus too. It has an advanced bristle design that tends to avoid tangling your hair and they have antistatic properties which help eliminate fly away hair too. The barrel brush can auto-rotate in both directions too for convenience. It can even be locked into position when adding curls or waves as you style your hair. This hot air brush is very lightweight (just 1.2 pounds) and easy to operate. Its padded handle makes it comfortable to use also. Both its auto-rotating trigger and heat selection switch are easy to activate with one hand while using it. The Infiniti by Conair Pro Spin Air Rotating Styler also allows you a lot of freedom of movement when styling your hair with it. That’s because it has an 8-feet long power cord with attached swivel end. The power cord is almost impossible to get tangled up as you use it. The absolute best feature on this hot air brush is its auto-rotating barrel. It lets you effortlessly dry and style your hair each time you use the Infiniti by Conair Pro Spin Air Rotating Styler. It’s nice to save time and relax as you style and dry your hair each day. One of its other great features is the built-in ceramic/ionic technology. This means the heater on this hot air brush will heat fast and heat evenly. It will also help you keep from damaging your hair as you style it. Ionic technology promotes hair moisture retention, helps eliminate frizz and gives your hair some added shine too. This product has a very good warranty that comes with it. That’s a good thing considering it has so many working parts on it. Conair backs it up for a period of 3-years from the date of purchase. One of the concerns some users had is that it does not work well on shorter hair lengths. That could be because of the wide 2” barrel brush width. This product is not dual voltage capable either. That means you don’t want to bother packing it if you are traveling outside the USA because these countries use a different voltage. It was hard not to like this hot air brush from Conair. It may be a little wide for short hair lengths but it does just about everything but plug itself in for you. With it, you can dry and style your hair quickly and do it at the same time. It includes advanced ceramic/ion technology so it dries and styles gently too. The fact the brush end spins automatically is an effort saver too. 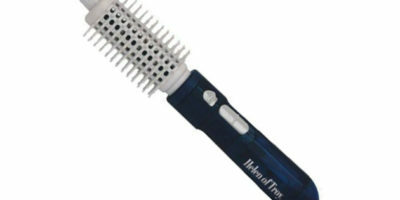 This is a hot air brush well worth considering for purchase if you are trying to save time when getting ready each day. Check Out Our Guide to the Best Hot Air Brushes!